My friend Lucy sent me an email a couple of days ago with some words of support and a cheering photo of her pup, Poppy. I adore Poppy even though I’ve never met her or her owner, both of whom live on the other side of the planet. Ain’t blogging grand? Yep. Blogging really is grand. SO loving the idea of guest dog blogging! (plus there is some talk down here of another visit to your shores…and there will be NO way of missing out on seeing you next time. NO way). Oh, Poppy, such a cutie. And Lucy, she’s just awesome, as are you. Hooray for dogs! Hooray for blogs! Another sweet pup. Sending one of Sinbad to you – hope he makes you smile a little bit. great to see some doggy devotion shared around the globe – blogging is grand! We got 2 pups from the SSPCA at Christmas – sending the photo as I type. Blogging IS grand. What a sweet girl Poppy is. Ah! that’s my granddog! she really is that gorgeous. 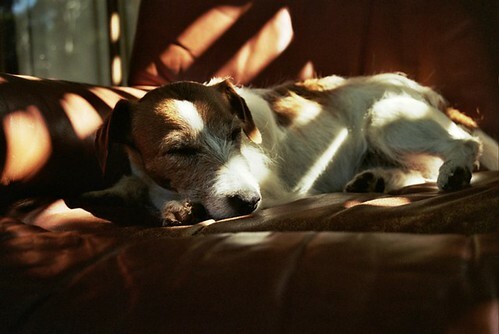 My sister and family have a wee Jack Russel too, and I’ll send on a pic of our Bob when he was with us. PS Love the Wolfhounds too, but how much room do they need! I really hope things get better soon, and am sending you good thoughts out into the blogging ether. I don’t have any dog photos (although have been squealing at all the cute shots) but I can supply copious amounts of cat pictures!